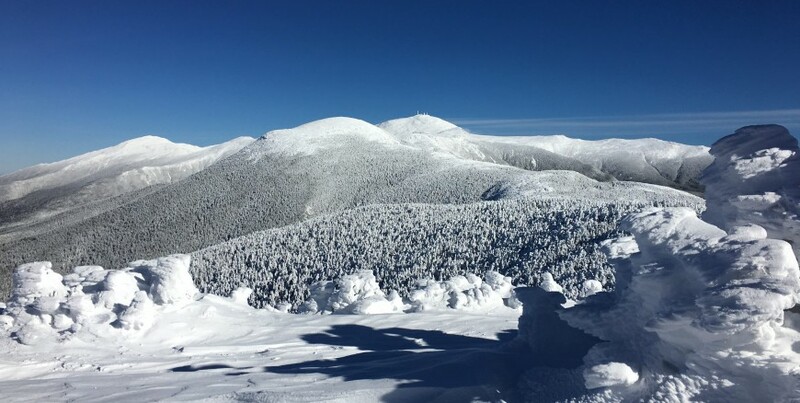 Mount Pierce is one of the best introductory 4,000 footers in NH. It features unreal views of Mount Washington and the Presidentials, it is located in the gorgeous Crawford Notch, and can be completed in less than a half day at 6 miles round trip. There are a few different common ways to summit Mount Pierce. When summiting without other peaks, Crawford Path is the most common and shortest route. Crawford Path – 6 miles – 2,400 feet elevation gain. This is the shortest route up Mount Pierce. There are two options for parking, at the Crawford Connector Parking lot on Mount Clinton Road, or at the Crawford Path trailhead just on the north end of Saco lake. There is little difference between the two, so the decision us usually based on the parking available. This route features a gradual ascent nearly the entire way up the mountain. This is a fantastic trail in all four seasons. This route is a little longer, and features more elevation gain. This is normally done when hikers are summiting Mount Jackson and or Webster in conjunction with Pierce. This route is a fantastic way to summit both Eisenhower and Pierce. The trailhead is further up Mount Clinton Road, and is closed during the winter months. Between the Crawford Connector parking lot, and Edmands path is 2.3 miles if you choose to hike it. Mount Pierce is one of the best winter hikes due to the gradual gain, stunning views, and the fact that hikers are only exposed to the elements at the very summit when coming from Crawford Path. There are few steep sections, making it a safe and enjoyable winter hike for beginners. Directions to Crawford Connector Parking Lot. Edmands path is only 2.3 miles further down Mount Clinton Road, and hikers can also park by Saco Lake at the parking areas and train station.